At St. Elizabeth Healthcare, headquartered in Edgewood, Kentucky, and serving the Greater Cincinnati region, we were the first hospital in the nation to implement dual Copan WASP (Walk Away Specimen Processor) automated microbiology processors and run multiple culture types through the instruments. Due in large part to the hard work of our microbiology and laboratory team, automation such as this has enabled us to bring microbiology services to a larger clinical audience. Prior to 2008, we performed all microbiology processing manually. In May of 2008, we automated front end processing of urine specimens until that instrument could no longer be serviced, at which point we began to look for a new platform to manage the increasing specimen volume. 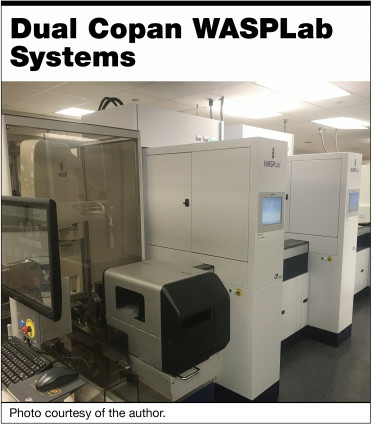 We acquired the Copan WASP processor in 2015 for urine specimens with the intention of bringing on its full automation line and using it for multiple specimen types. Advantages of this processor included an LIS interface which helped substantially reduce manual labeling of culture plates and the chance for clerical or labeling errors. This initial robotic system manipulated loaded specimens and culture media into proper locations to be streaked and then moved them to an area to be manually placed in an incubator. We decided to install the full automation for this system, WASPLab, in January of 2017 and went live just three months later, testing urine and swab specimens. The full automation added a closed system that bar codes and automatically sorts the plates, places them into either the oxygen or carbon dioxide incubator, and enables digital photography while they remain in incubation. Being able to observe growth (or lack thereof) on the plates while they remain in incubation has been invaluable. The plates themselves are only removed for wasting (in the case of negatives) or processing, including identification through MALDI-TOF, and for susceptibility testing, if applicable based on specimen type and source. While the Copan WASP is fully capable of processing urine specimens, perhaps the greatest advantage it delivers is the ability to run practically all submitted specimen types, including body fluids, respiratory specimens, stool specimens, and wound and other superficial body-site swabs. By maximizing the utility of the device, reducing the number of manual steps involved in microbiology front end processing, and extensively training on the new workflow, we have been able to expand microbiology testing services to all shifts. Previously, we were only able to offer microbiology culture plate reading during first shift hours given the time it took to manually sort, read, and begin workup on potentially hundreds of plates out of an overnight incubator. In 2017, we partnered with a clinical laboratory whose parent facility was relocating, and in doing so, we were able to create a joint laboratory venture serving multiple health care sites. The combination of workflows created enough volume to justify onboarding an additional Copan WASP automated processor and smart incubator system in 2018, which went live in June. This dual system is now running on all shifts, providing our clinicians with unprecedented access to microbiology testing. That said, the ongoing and well-known scarcity of skilled microbiologists remains a challenge to our laboratory and many others across the country. The economy of process that the Copan WASPLab systems has enabled in our lab is notable, but without skilled technologists running the systems, performing validations and proficiencies, and processing the resulting data, no amount of automation will suffice. As a laboratory using two Copan WASPLab systems together for multiple culture types, we are running a rather unique operation. The dual processing power of the system has allowed us to offer microbiology services throughout the work day while reducing the number of handling steps inherent to microbiology testing (and therefore, the associated risk of error). That said, there is no replacement for skilled microbiologists, and full automation in microbiology practice is new, so laboratories should take a diligent approach to automation adoption. As always, preparing staff for change and finding the most efficient integration of new technology into your practice will help ensure project success. Patricia Nortmann, MBA, MT(ASCP), is the director of laboratory services for Saint Elizabeth Healthcare in Edgewood, Kentucky.